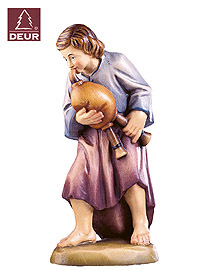 Nativity Set Figurine Farm Nativity: Shepherd Boy with Flute / Bag Pipe. The figurine is made of wood and is hand-painted in Tyrol, Italy. These figurines are glazed with oil paint and gold-plated. The actual size of the figurines varies. The reference figurine is that of Joseph. This figurine is 9cm / 3.54inches tall. All other figurines in this size group are in the correct size relative to this figurine. All figurines are available in different color or stained variations; from a natural wood finish to highest quality color and gold paints. The Val Gardena is world-famous for its wood carvings. Be it religious figurines and carvings of saints, or profane figurines, each piece is a work of art and proof of a centuries old tradition of craftsmanship. All figurines and series are garanteed available for many years. Thus a nativity set like this can be completed by and by, over many years. Such a nativity set is a collectors item, which will be cherished for many years. Manufacturer: DEUR / O. Demetz; Tyrol; Val Gardena, St. Christina, Italy.